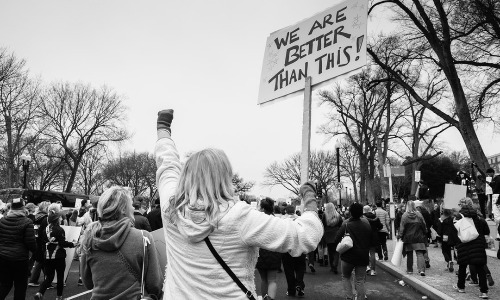 In January 2019, I asked Joy Anderson from The Criterion Institute to share what she learned from organizing several Convergence gatherings on gender lens investing. I’m privileged to have attended the first of these gatherings in Simsbury, Connecticut and am excited to be carrying some of this work forward by co-facilitating “Women and Money: Making Money Moves that Matter” with Tracy Gray September 16–17 in Austin. Joy was kind enough to talk to me about what she knows to be true about field building and gathering people to commit to new actions together. TUTI SCOTT: As we prepare for this Women and Money gathering, I’d love to hear about what you learned from hosting Criterion’s Convergence gatherings. JOY ANDERSON: Yes, but first let me share what we’re doing right now. 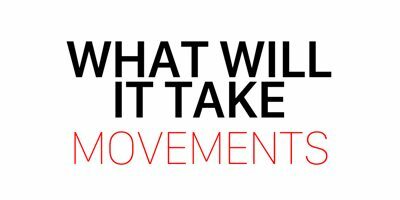 Criterion has three goals this year… The first is expanding who sees themselves as able to use finance as a tool for social change… We start with this framing [because if you start] with “how to move money,” then people start thinking about their constraints around money. They feel like they don’t know anything about money, investments, or capital, and they have to go talk to their advisors. We start by asking, “What social change are you trying to create?” Then we can talk about power dynamics and how social change happens because sometimes, finance can be a tool for social change. There are no silver bullets, finance is not some magical thing we should all bow over to, but sometimes, in some contexts, if you pay attention to a broad set of contextual information and do things with an intersectional lens… you can potentially advance [gender equality]. But it starts with having a little more humility. Our second goal is to show the power of policy within investing, the role of government in upping the game of gender lens investing. Policy and finance inform each other. We want to have gender lens investing be a little less about identity and more about power for a couple reasons. One is the essentialism by which we talk about gender. If we shift from talking about gender lens investing as something that’s about women, and talk about power dynamics instead, we may get to a better analysis. We also may get to more inclusivity if we talk about gender overall. Our third goal is that we’re taking our first two goals, merging them, and addressing gender-based violence [with a finance strategy]. SCOTT: It’s fascinating listening to you, Joy. I love your brain and your brilliance. I say this with great respect, you are one of the grandmothers of the movement. I always think of the first Convergence gathering I attended, and the grace and hospitality with which you welcomed everyone. ANDERSON: The power of invitation. SCOTT: Power of invitation… On that note, I would love to hear what worked best in terms of the invitation to Convergence? What can we bring forward? ANDERSON: Convergence was something we did 17 times. There were no workshops, no speakers. We designed the context based on who was coming. We wanted to take the hallways and put them into the room, which is similar to what people in Open Space do, but we did it with more support… From a marketing perspective this sucked, which is largely why we stopped doing it. It also engaged a system of privilege because people who can come to an event without an agenda including a named set of speakers and expected learning outcomes tend to be higher level. So it was senior people, which created problems over time. There were inequities in our approach… But Convergence was also just so counter to what people [expect]… We didn’t share who was coming publicly because we found that as soon as we did, people came only because someone else was going to be there. People wanted to get air time with specific people. This created strange power dynamics. People felt safe to be in conversations they might not have chosen to be in and they saw themselves in the questions… The thing I liked — and this was the case at the Gender-Smart Investing Summit, too — was that we ended the day by asking, “What are you moving forward?” Hundreds of partnerships and collaborations came out of Convergence. It worked well for people who were trying to find their way through a conversation. For so long nobody knew how to do gender lens investing; there wasn’t an expert in the room explaining it. We used Convergence gatherings to build the field, and we still do that. 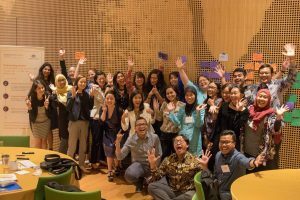 We just did a series of workshops in Southeast Asia where we said, “We’re opening up a space where you can work together and decide what’s possible.” I remember one Convergence when a leader said, “Somebody needs to tell me how to do gender investing metrics.” I told her nobody had the answer. She eventually got it. She needed to [answer her question] rather than go looking for an answer. That was a big part of what Convergence was about. SCOTT: At Women and Money in September, we’re trying to create a space for people to co-create a manifesto of actions, beliefs, or new practices around gender lens investing. 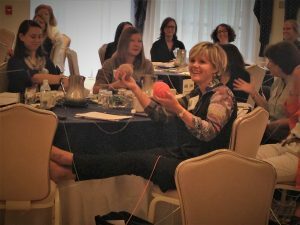 How did you capture all of the good ideas that came out of Convergence conversations to keep people connected and working together? to share knowledge with folks who couldn’t be in the room? ANDERSON: I always distinguish between the experience of being in a room and the work of coming up with communication devices to communicate to other people. But one of the ways we do design work is that we schedule a series of conversations and commit to sharing what happens in between conversations… People have a great desire for collective action. For me, when we try to move towards collective action, particularly around gender issues, it so often becomes about “women’s economic empowerment” and funding women’s businesses. There’s something reductionist about what can we all get on board with versus getting clear on all of the things that we can collectively go try and do and get experimental with. In our gender-based violence work, for example, we offer our own definition of gender-based violence, but we say that there are five other definitions. We don’t have one framework for looking at impact because people have been talking about different frameworks of impact forever. We absolutely respect the people who spend their entire lives doing this work. We’re not going to come up with one single, better gender lens investing strategy that simplifies things for people in finance. LEX SCHROEDER: One thing that I hear listening to you, Joy, is that you’re allowing for multiplicity. Convergence sounds like it was rooted in inquiry and learning both. I see the foundation of systems thinking. But it sounds like Convergence wasn’t only about self-organization or emergence, right? You wanted these gatherings to feel deeply curated? With Women and Money, the invitation definitely isn’t “come and be in inquiry.” There are speakers who will share new information. So it’s a combination of inquiry, co-creation, and listening to some really fierce leaders in the field who will be saying, “You can do these five things.” Within this context, do you think team agreements and/or event guiding principles are important? ANDERSON: Yes. I can send you the principles we started Convergence with… We had a set of practices that helped people participate effectively… But I’ll just stick with the multiplicity thing. People learn in very different ways and have very different on-ramps. SCHROEDER: Do you mean different entry points to the gender lens investing conversation? ANDERSON: Yes. What’s the on-ramp to get you in? In terms of team agreements, if you say everybody will go down the same pathway to gender lens investing in the same way, that doesn’t honor people’s different lived experiences. There is a bias. 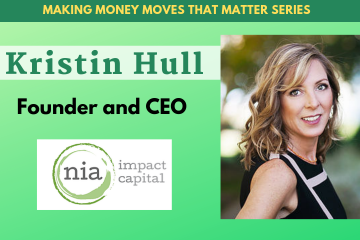 One of the things that happened in impact investing, for example, is that a bunch of leading angel investors essentially said that the way you learn how to do impact investing is to practice making investments in early stage companies because that will help you learn. And so you ended up with real estate investors who were on an on-ramp to impact investing being told that they were supposed to lose money nine times out of ten [for the purpose of learning]… That made no sense! It’s about respect. Some people will say, “I need to understand how this all fits together.” For others, they want something like a weight loss app that says, “You don’t have to think about anything more than whether or not you filled in this form today!” We push for a multiplicity. 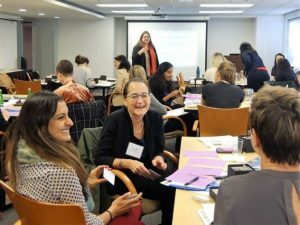 So at [Women and Money], maybe name that there are at least five different sets of people participating in the event, and these groups have different ideas and agreements about they want to engage based on what they are trying to accomplish. SCHROEDER: Or just name the different entry points. Some people will want to listen to speakers. Some will want to go to sessions about co-creating a manifesto of actions because Tuti is saying we need to move to action more quickly. Other people will go because they want to focus on networking. ANDERSON: Right, and intentional design for multiple experiences based on people’s different learning styles. SCOTT: After Convergence, how much of the community stayed together and worked together? 10 percent? More? Less? What do you think helped the community stick together in between gatherings? ANDERSON: There are different answers here, but mostly, we just named that we weren’t responsible for the community. This had the impact of people organizing on their own. ANDERSON: Right. The first five years of gender-lens investing, Criterion did 75% of the field-building work to move things forward and engage different people. We did that for a total of $1 million of philanthropy… Self-organization is just less expensive! And you don’t have this command and control function where people feel like they need to ask permission to go do things. We said, “You are the field, go build it. We’re here and we’ll talk to you, but we’re not responsible for you…” Part of the reason we couldn’t raise funding is because we couldn’t say, “Here are the 100 people who are following everything we’re doing and working with us. It was more like, “Here are an unknown number of people who have jumped onto this and gone off and done actions, and we’re not tracking all of them.” This was a decision. What I would do, however, is find people who I knew needed help. Criterion would say, “We’ll venture with you to move you forward,” but it wasn’t the whole community coming together… We went through similar questions around The Women Effect. We were asking if it was possible to build a business model around a community. What we found with Convergence — and we still find this today — is that people are more interested in a particular set of actions. So if it’s an issue that we’re interested in, we organize something; if people are interested in something else, we create space to talk about it and they organize that other thing. SCOTT: This is where we’re intersecting with more than just gender-lens investing, right? We’re talking about ethical business and looking more broadly at money and gender, right? SCHROEDER: So much of it seems to come back to personal agency. SCOTT: Last question, Joy. Can you speak more about the work you are doing globally on gender-based violence? We’ve gotten about 50 ideas on how to use finance to address gender-based violence so far. We’re pushing funds managers and others to adopt these strategies. We’re talking about the consolidated intent of asset owners who repeatedly say to their asset managers, “I really wish this was being addressed.” We’re doing a question of the month campaign so that asset holders ask the same question of their advisors at the same time. This way we end up with an echo effect through Bank of America and other places where everybody’s hearing, “Have you effectively analyzed the underlying risk that my assets are facing because of the connection between gender-based violence and political instability? Where has that been addressed in my portfolio? Oh, you don’t know the answer to that question? Have you spent any money to try to answer it?” We are equipping asset holders with tools to ask questions that should be answered. We help people say, “This is a risk, we have evidence that this a risk, so why haven’t you done anything about this?” I think a lot about how to teach people to be activists in a particular context and do work that is tied to realistic social change strategies informed by people who know something about gender. SCOTT: Thank you, Joy, for always holding the space for new thinking and meaning making around challenging concepts and issues. We are so fortunate to have you out front on these topics and putting a gender lens mandate inside finance. Thank you for your time and smarts. Joy Anderson is a prominent national leader at the intersection of business and social change. 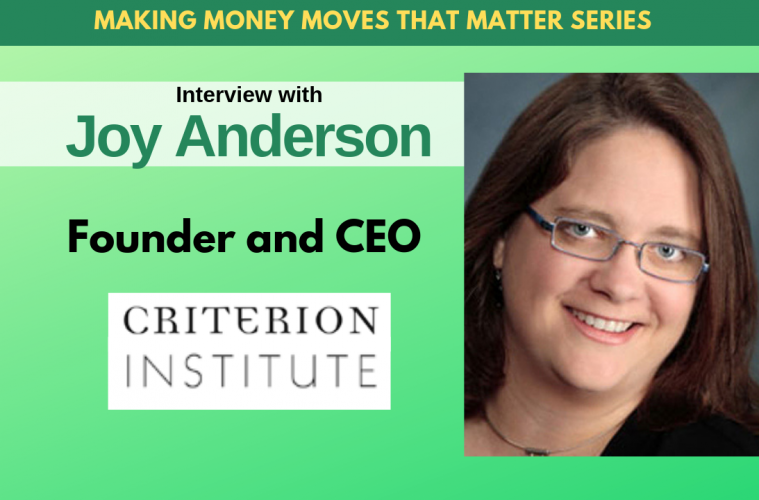 She leads Criterion Institute which serves as a think tank around shaping markets to create social and environmental good. Criterion houses three field building initiatives, Structure Lab, Gender Lens Investing and Church as an Economic Being. Her speaking and thought leadership is focused on the practices of shaping markets, whether that is focused on how the church is both an actor and implicated in the economy, on how legal structures shape the possibilities of enterprises, or a gender lens on investing. 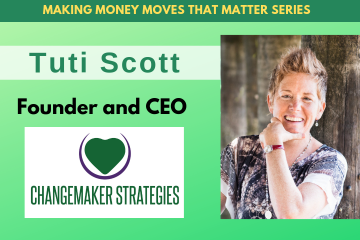 Founder and president of Changemaker Strategies, Tuti Scott serves as a “Chief Inspiration Officer” and guide to countless leaders and teams that are advancing social change. With more than 25 years of experience educating and energizing bold change makers, Tuti advises organizations and boards on strategic planning, succession planning, governance, fundraising, and leadership development. Whether as coach, strategic planner, or facilitator, Tuti helps teams navigate growth, define the scope and scale of their work, and achieve critical sustainability. Les Schroeder is a writer/editor in the systems thinking community who is trained in lean process design and participatory leadership methods. She leads on strategic communications at Changemaker Strategies. In addition to developing communications materials for clients, Lex works to get Changemaker Strategies publications and resources to where they can make their greatest impact. In addition to her work with Changemaker Strategies, Lex is the Co-Founder of Feminists at Work, through which she co-produces the Entrepreneurial Feminist Forum.